Muay Thai or Thai boxing is a famous sport of Thailand played for entertainment and fitness. The fighting involves the whole body as the techniques followed are kicks, elbow, punches, and blocks. 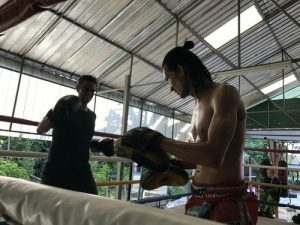 You can go for Muay Thai training as early as you start walking on your feet. It’s for everyone for the purposes of learning are different. It keeps you physically fit by strengthening the bones and minimizing the effects of aging. Even if you are looking to lose weight along with maintaining your health, then this martial art is the best option for you. The cardiovascular system gets strengthened by practicing the sport. Besides, the long muscles in the legs are especially benefitted by the training provided during Muay Thai sessions. But yes, you have to be preventive if you are suffering from any ailment or previous injury. The Muay Thai is a complete form of art as it uses the whole body of the individual including fists, knees, elbows, shins, and legs. The techniques are so designed as the fighters have to use eight points of contact to face their opponents while boxing involves the use of only two contact points, and kickboxing includes only four. Besides improving physical strength, Muay Thai also works on relieving stress and increasing mental energy. It can also be employed as a tool for self-defense. Women, primarily, utilize this sport to learn the art of protecting themselves. The fighters can maintain their body shape. Socialization is another advantage of Muay Thai. Share your experiences with the fellow fighters and create a group of friends to be treasured forever!